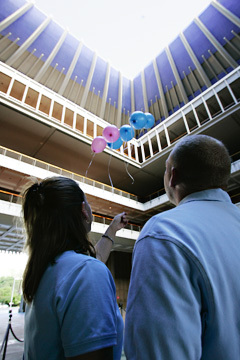 Laura and Bobby Shaw honored their baby at the State Capitol Rotunda, where they released balloons during Pregnancy and Infant Loss Remembrance Day earlier this month. ROBERT and Laura Shaw were overjoyed to learn they were going to have a baby. Candlelight memorial service for babies who have died through miscarriage, ectopic pregnancy, stillbirth and newborn death. » "There was probably something wrong with the baby" or "Your baby must have been sick." » "You're young. You can have more children." » "At least you really didn't know the baby." » "Better it happened now, rather than later." » Do try to listen and be supportive. » Do remember that a simple "I'm sorry" will suffice. A hug or loving gesture may also help. » Don't offer unsolicited advice. » Don't ask too many questions. Group meets 4 to 5:30 p.m. on the first Saturday of each month at Kaiser Moanalua's second-floor conference room. Attendees range from those who've experienced a miscarriage to folks who have lost newborns. "People may come for six months or five years. It provides a safe environment to talk about their deepest pain," said Lynn Kalaiwaa, the nurse who runs the group. "We couldn't believe it," said Laura. "We were by no means trying, as we had only been married for three months. We couldn't wait to get home and call all of our family." They decided on a name --Tyler Jarrod -- on the way home from the hospital after receiving the pregnancy results, and spent the next several months preparing. "The nursery was completely set up," said Robert. But within days of her due date, Laura felt some uncomfortable pressure and went to the hospital. The nurse was unable to find a heartbeat on a fetal monitor. After an ultrasound and other tests, her doctors delivered the devastating news: The baby had died. "We left the hospital in tears, dreading making the calls to our family." They had to return to the hospital the same evening to have labor induced and deliver their baby. It is for couples like the Shaws that the Queen's Medical Center, Kaiser Permanente and Tripler Army Medical Center team up to host a candlelight memorial service for babies who have died during pregnancy or as newborns. The event allows those grieving to be around families who truly understand what they are going through. The loss can be overwhelming. "The first few weeks were very emotional," Laura said. "I spent a lot of time sitting on the couch or lying in bed." Robert noted that he kept busy until he "burned out." One month later he was deployed to the Middle East for six months, forcing the two to grieve separately. The military offered support. "Co-workers become family when you live in such close quarters," he said. But some family and friends shied away. "They got to a point where they just didn't know what to say to us," said Robert. Reid Mateo, 8, keeps close tabs on Avry Mateo, 17 months, as the children's parents, Deena and Irenio Mateo, discuss the loss of their baby girl. Irenio and Deena Mateo also lost their baby late in the pregnancy. "We were in shock after three successful births," said Deena. "We chose to induce labor and had a natural childbirth. We still had hope that all of the machines are wrong. When she was born, it was bittersweet. She had arrived but would not be able to stay with us." The staff suggested the couple bond with the child as if it were a live birth. "It is very important to say hello before you say goodbye," said Irenio. "We called all of our family, and they brought cameras." They named their daughter Tylar Anelaokawaiola. Both couples said that even close family members and friends made insensitive comments, the most common being, "You are young and can have more kids." One man even blamed Deena, saying that she had caused the loss by carrying her young son while pregnant. "No one can say or do anything to make us feel better about our child's death," she said. "The excruciating pain consumed us. The kids were pretty much on their own. We would crawl moment to moment, struggling through every moment." "Sometimes I would find her crying on the floor in a fetal position," said Irenio. "We couldn't laugh about anything," added Deena. "When we finally began to chuckle, we felt guilty." But their marriage actually became stronger because of the need to rely on each other. Eventually they found outlets. The family engaged in both hula and kempo karate classes together. "We had to decide to live happily," said Deena. Hugs, gentle squeezes, pats on the back and simple expressions of sympathy were most encouraging, the Mateos agreed. A strong Catholic faith also helped them tremendously. The Mateos' youngest son Avry was born 17 months ago. "There was lots of anxiety during the pregnancy," said Deena. "We used a monitor to listen for the heartbeat ... we would listen about every 10 minutes," added Irenio. "We wore that thing out, and by the last month we were holding the batteries in." An important way for both couples to ease their grieving was creating keepsakes in honor of the children they had lost. The Shaws have a memory Web site dedicated to their son, scrapbooks and a shadow box with photos and footprints hanging on the wall in their home. The Mateos created scrapbooks and a memory box decorated with various materials. "You could use decoupage or mosaic as a form of healing through art. The idea was to use broken pieces to create something whole." Laura also found that reading helped her cope, especially a book by Hannah Lothrop called "Help, Comfort & Hope: Losing Your Baby in Pregnancy or the First Year." Online support groups also helped while her husband was deployed. "It was great to have a place to vent anger, frustration, concerns and discuss the many heartless things family and friends say during the initial stages of grief." Grief is often unnoticed and misunderstood, Laura said. "People expect that because the child wasn't living in your life, you don't have a bond and should be able to get over it faster. I had a bond for the nine months I was carrying him." "A loss is a loss," said Cindy Nachtigall, a pediatric social worker and bereavement counselor at Tripler Army Medical Center. "It doesn't matter if it is your baby, grandparent or spouse. It is all the same, a part of a family unit. "When babies die, we lose hopes and dreams. This is a real person. Sometimes college funds have been established and lives are sketched out." The chaplains at Tripler Army Medical Center work hard to create the special memorial service each year, Nachtigall said. "It can take months or even years to grieve a loss. We had one fellow come last year who had lost a child during the Korean War." One of the main things she tells parents is not to blame themselves. There is a 99.9 percent chance that they didn't do anything to cause the loss, she said. "Parents carry these feelings forever. But to light a candle in a baby's memory is so healing. Rituals play an important part in the healing process."